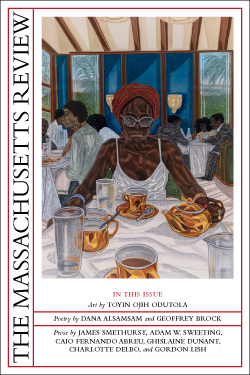 The Massachusetts Review is published four times a year in quality paperback with a full-color cover. It is distributed nationally to bookstores by Ingram Periodicals and MediaSolutions. Single-copy price is $10; one-year subscriptions are $29. A sample of the magazine’s contents is available on our website. MR has a highly educated, international audience of readers, largely college-educated and involved in social justice and creative communities. Subscribers: approximately 800 print (75% Individual, 25% Institutional; 90% US, 10% Foreign); approximately 2,000 online through ProjectMUSE. Print: 4.333" horizontal X 7.25" vertical; minimum 300 dpi grayscale PDF with all fonts embedded & images linked. No color or bleeds. Please do not send files in desig programs. The editors reserve the right to decline any ad not in keeping with Massachusetts Review’s aims and purposes.